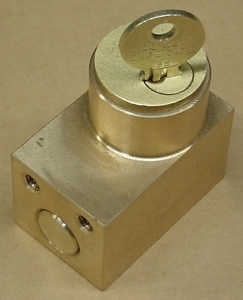 The Superior Locking Unit, type B-7003, is a key actuated bolt mechanism designed for many front mounting applications where mounting space is limited and facilities are available to permit the use of a mechanical locking bolt device. The Superior B-7003 can be either surface or sub mounted. Compact in design, its narrow profile is helpful when space is an issue, and front mounting is required. A full width version is also available. This device is suitable for many OEM and existing applications. Some uses include but are not limited to, circuit breakers, disconnect switches, ground switches, valves, and many other mechanical and electrical devices. A suitable compact switch element or multiple auxiliary contacts are also available for use when it is necessary to provide additional electrical protection, provide feedback, signal PLCs, operate indicating circuits, or open and close other electrical circuits of the interlocked equipment. The Superior Locking Unit, type B-7003, is constructed entirely of non-ferrous material, and, for this reason may be used for outdoor service, provided dust covers are used to protect the lock mechanism. The case is bronze. The interior parts are all non-ferrous or stainless steel and are precisely adjusted to insure perfect key release. 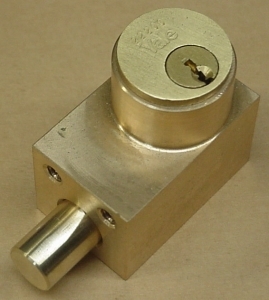 Type B-7003 is available for single key, two key, and up to six key operations, with and without auxiliary contacts. Many accessories and options are available for these units. Please see cut sheet or call our factory for details.